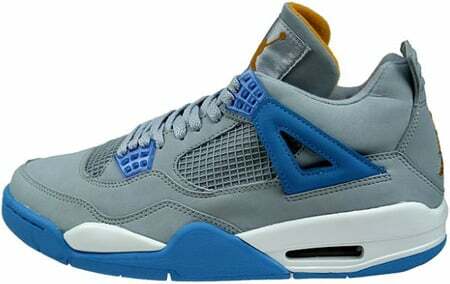 The Air Jordan 4 (IV) Retro Mist Blue was nicknamed the Melo Jordan 4, due to the resemblance of colors used by the Denver Nuggets. At the time of release, a lot of matching clothing dropped with the Air Jordan 4 (IV) Mist Blue. Meaning, the Air Jordan 4 (IV) Retro Mist Blue was a Lifestyle release, and a retail price of $125. The Air Jordan 4 (IV) Mist Blue released June 24th 2006.